Camp Cady was located on the Mojave Road which connected Los Angeles to Albuquerque. Non-Indian travel on this and the nearby Salt Lake Road (Old Spanish Trail) was beset by Paiute, Mohave, and Chemuehuevi Indians defending their homeland. To protect both roads, Camp Cady was established by U.S. Dragoons in 1860. The main building was a stout mud redoubt. Improved camp structures were built in 1868. After peace was established, the military withdrew in 1871. This protection provided by Camp Cady enabled travelers, merchandise, and mail using both roads to boost California's economy and growth. Camp Cady Wildlife Area is approximately 1,900 acres of desert riparian habitat, consisting of screwbean mesquite, tamarisk, willow, cottonwood, saltgrass, saltbush, and cattails along the Mojave River, which passes through the center of the wildlife area. Elevation ranges from 1,680 - 1,760 feet. The area is habitat for Mojave tui chub, hawks, songbirds, and shorebirds. 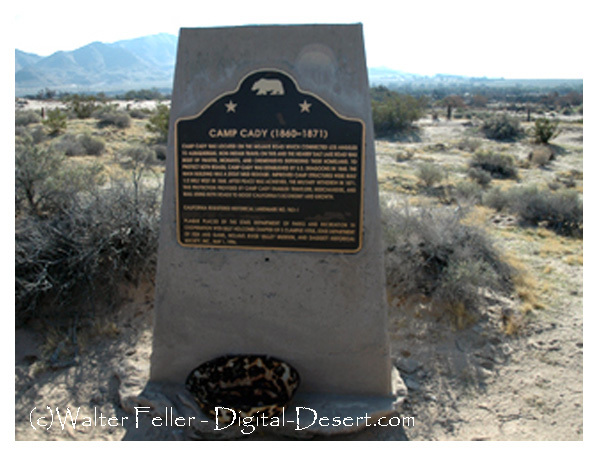 The site became known as Camp Cady in 1860 when the U.S. military established a base camp to suppress Piute Indian attacks on wagon trains. The base was named in honor of Major Albemarle Cady of the 6th Infantry at Fort Yuma. The fort was strategically located along the road to Fort Mojave and close to the Salt Lake Trail which crossed the desert to Las Vegas, Nevada. Remnants of the fort can still be seen about one mile from the headquarters buildings. In 1871, the land and buildings were sold to a civilian stockman and the military mission was finished. At one time, the property was planned and developed for an Arabian horse ranch. Although structures were built for this purpose, this venture never materialized. Historically, wildlife has been hunted along many areas of the Mojave River. The previous landowner considered developing the area into a private hunting club for upland game and waterfowl species. The property was acquired to preserve desert-riparian habitat and associated species. It was designated as a wildlife area by the Fish and Game Commission in 1980.